WHAT DO YOU THINK ABOUT OUR CUSTOMER SUPPORT? LET’S START OFF WITH INFORMATION ABOUT PESTEC. CAN YOU PROVIDE A HIGH-LEVEL OVERVIEW OF YOUR COMPANY? Pestec is a second-generation family owned and operated pest management company, which was started by my father in 1985. Our company provides pest control services to commercial, Residential and government clients in the San Francisco Bay Area and Northern California. We are specialists in IPM or Integrated Pest Management. With IPM, we can fulfill our company mission of discovering, developing and delivering the best services to improve the places we live and work. YOU MENTIONED IPM. CAN YOU PROVIDE MORE INFORMATION ABOUT INTEGRATED PEST MANAGEMENT AND ITS OUTLOOK FOR THE PEST MANAGEMENT INDUSTRY? but in structural pest control it began with wood destroying organisms, such as termites. Integrated Pest Management requires professionals with good training and lots of experience to conduct thorough inspections, to identify how pests are entering buildings and develop strategies that provide long term value for their clients. IPM also includes general or household pest management, which is a newer application but embodies the same idea. For example, we don’t want to just harvest dead mice, but we want to find out how they are entering buildings and close those doors. It is critical to preserve the indoor environment and keep them from continually creating more damage. The outlook for IPM is very good as the number of pests increases due to globalization, climate change that warms up the world in some cases, and consumers access to professional grade pesticides online. It is going to be really essential for experienced pest management professionals to differentiate themselves, so they are not just considered applicators of pesticides but are able to really solve people’s problems in a long term, safe manner. Pestec is always interested in finding tools that offer these services, and Burrtec provides one of these tools. 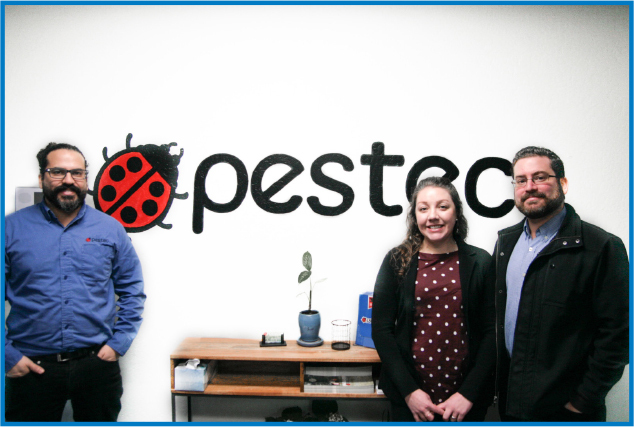 Pestec is a second-generation family owned and operated pest management company, which was started by my father in 1985. From left to right: Carlos I. Agurto, VP & Technical Director; Vlarie Agurto, Operations Manager; and Luis Agurto Jr., President & CEO. YOUR LAST STATEMENT PROVIDES A NICE SEGUE INTO OUR NEXT QUESTION. HOW DID YOU DECIDE TO USE BURRTEC PRODUCTS? We are always on a hunt for new tools and methods, and we discovered Burrtec at a pest management trade show called PestWorld. We ran into a Burrtec sales rep and recognized quickly that their door sweeps are good products. We tried out the door sweep with the double-sided tape on one of our office doors. It was easy to install and the sweep stayed on the door for quite a while. WE KNOW YOU USE BURRCUT FLEX AND BURRAT SAMURAI ARMOR DOOR SWEEPS. WHERE HAVE YOU APPLIED THEM AND HOW WAS THE EXPERIENCE? Our business runs the whole gamut, including restaurants, hospitals, schools, universities, courthouses, fire departments, police stations, and other commercial buildings. Schools in California must adhere to the Healthy Schools Act and this incentivizes schools to use effective, least toxic pest management practices. Many of the schools we service deal with outdoor cockroaches and the sweeps are the perfect pest prevention tool for this issue. Pestec technicians working at the schools use the Burrtec roll making installation very easy. Schools have a lot of doors of various lengths. The technician can quickly cut pieces of the roll based on the door lengths and doesn’t have to wait on the office to order individual door sweeps. We even service the largest “green” building in California with the greatest number of visitors on a daily basis. Since many of our customers are institutions, many of the buildings we service are also historical buildings where we find mice and Oriental Cockroaches can enter via large gaps at the bottom of their doors. We just can’t go and slap on a standard sweeps because from the historical preservation point of view we would deface the door by drilling holes into it. The Burrtec Door Sweeps can attach with an adhesive strip, which allows us to “close those doors” by sticking them on in a way that is not permanent. This is a big advantage for Burrtec. The Burrat Samurai Armor Door Sweep is used most often in commercial buildings with rodent issues because it has a metal covering that rodents cannot chew through. While we often use the Burrcut Flex for crawling insects because it offers a brush/sweep combo. We installed it in one public works building that had an infestation of cockroaches known as the Friendly or Three-lined roach, which is only a quarter inch long. After the Burrcut Flex was installed there was a 98 percent population decline. This door sweep is also often used in museums to keep the collections safe. They keep out moths and beetles that love to eat potentially priceless collections. CAN YOU SHARE ANY TIPS WHEN INSTALLING THE DOOR SWEEPS? When installing the Burrat Samurai Armor Door Sweep on metal doors, we like to pre-drill holes first with a drill bit. It is more difficult to install on metal doors than wooden doors. Then we use a self-tapping screw or sheet metal screw. We also like to use a few extra screws to guarantee it stays tight. When installing the Burrcut Flex, we clean the door and the back of the door sweep before we apply the adhesive strip. This really helps to ensure that the door sweep adheres much longer. We may add a screw or two to certain doors to ensure it does not sag in the middle. HOW IS BURRTEC’S CUSTOMER SUPPORT? Burrtec’s customer service is excellent. We have a dedicated rep who is very responsive. We email our orders to him, and these orders are often sent out the next day. They really provide a personal touch. HAVE YOU EXPERIENCED ANY CHANGES AFTER YOU STARTED TO USE BURRTEC PRODUCTS? We have been able to expand our service of rodent exclusion to more clientele and in a more profitable way since more of the door sweeps are in the hands of our personnel. Burrtec products have helped us to narrow down our toolkit. They have a wide application, and they have definitely become the preferred method for historical buildings and buildings with irregular landings. Since this is a brush, the irregular floor does not become an impediment as the sweep crosses it. We have reduced the number of different door sweeps we carry, which is a big benefit. Burrtec door sweeps come in rolls so we can easily customize them to fit any size door. Now we think of door sweeps as another device that we need to actively manage. We keep track of them in our system and monitor how the door sweeps are doing. For direct benefits, we have seen an incredible decrease in the number of reports we get from school staff for cockroaches on the inside of classrooms. WOULD YOU RECOMMEND BURRTEC PRODUCTS TO OTHERS? We already recommend Burrtec products. We are contracted as Structural IPM trainers for the Department of Pesticide Regulation Healthy Schools Act training workshops. On the workshops, we take school personnel in charge of implementing IPM programs on guided inspections and hands-on activities at schools across the state. We teach them what conditions create pest problems and what they can do to prevent pests. We show them the Burrtec Door Sweeps because like Pestec they don’t want to carry huge stocks of materials. These affordable, lightweight door sweeps provide a win-win situation. The Burrat Samurai Armor Door Sweep is perfect for rodent infestations while the Burrcut Flex Door Sweep takes care of insect issues. WHAT WOULD YOU EXPECT FROM BURRTEC MOVING FORWARD? the pest management industry and facility managers, and expanding their product line. New products take time for adoption, but we hope they are persistent and continue to be active members of our industry. A special thank you to Mr. Luis Agurto Jr., President of Pestec, Mr. Carlos Agurto, Vice President and Technical Director of Pestec, and Mikail Price, Branch Manager of Pestec San Jose Office, for taking the time to share their great insights into the pest management industry. FROM PESTEC TECHNICIAN – Ricky Robles Jr. I love the Burrtec door sweeps. They are great help for a lot of exclusion work throughout the Bay Area. All you need is a level, a tape measure, self-tapping screws, and a cutting tool! Pestec is our first customer in the US, and we would like to express our sincere gratitude for the relationship with you. We promise to keep offering the best products possible to meet and exceed your expectations. Thank you again and we look forward to working with you.